Meet the 2014 Chevrolet Corvette Stingray C7 – the seventh generation of the fabled American performance car that was introduced at a private event tonight in Detroit on the eve of the 2013 North American International Auto Show. For months now, the automotive world has been grasping at anything pertaining to the 2014 Chevrolet Corvette from spy shots to service manual images to tooling videos to the recent GM teaser videos but tonight the wait is over – the C7 is here. Tonight at an invite-only event in Detroit, General Motors introduced the seventh generation of the Corvette and while all of the leaked images gave us a pretty good idea of what to expect but that doesn’t make the introduction of the progressive new Corvette any less exciting – or impressive. Along with the new engine, the fully redesigned exterior and the refined, high end interior comes the return of the Stingray name that so many associate with the great Corvettes of the 1960s. While the Chevrolet Corvette has undergone some major changes in its 60 year existence, the 2014 Corvette brings about one of the most substantial alterations with the rear end of the new American sports car. While the size and shape of the taillights have changed over the last 6 decades, the Corvette has always featured dual circular taillight lenses but the C7 Corvette wears angular taillight lenses that are unlike anything that we have seen on the fabled Chevy performance car in the past. If anything, the 2014 Corvette taillights are more similar to what we see on the current Chevrolet Camaro and Malibu so it seems that GM has looked to have their supercar share styling of the rest of the current model lineup. These taillights are sunken into a rear fascia that is vastly more angular than previous generations as the curvy hind quarters of Corvettes past have been left behind and in their place is a rear fascia that ends in sharp, aggressive looking angles. The back end of the 2014 Corvette C7 is radically new and at the expense of bringing back some awesome 80s terminology – the back end of the C7 Corvette is just plain radical…dude. Honestly, while some of the old white haired Corvette crowd may frown upon the obvious departure from the traditional cues of the Corvette lineup, I love the new look and I suspect that many people in GMs target audience will too. Plus, even those babyboomers who whine about the things that they do not like at first will still run out to buy one once they hear that their young, hot nanny thinks that the new Vette is cool. Across the front end, the 2014 Chevrolet Corvette is all new but still very familiar due to the basic lines being similar to the previous generation GM supercar. Like the C6, the C7 Corvette has fixed headlights (as opposed to the pop-up units of the C2-C5 Corvettes) with HID projection assemblies accented with LED trim along the bottom that provide a great, high tech look. 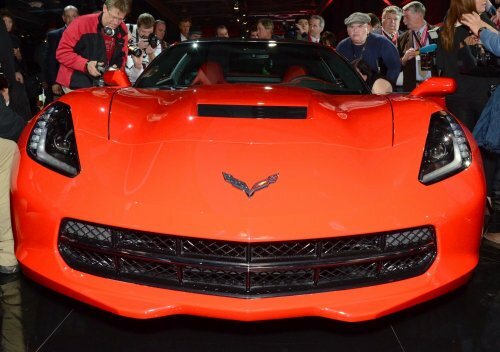 The front end has an angry look to it with a low nose created where the strongly sloping headlight lines meet with the new Corvette logo above and a massive hexagonal opening just below in the front fascia. This smooth front fascia with the large central opening offers a very race-ready look while also bolstering the aerodynamic properties of the new Corvette nose. Like many other high end performance cars around the world (including the 2013 SRT Viper), the 2014 Corvette grille dominates the landscape of the front end but this design looks great and should be able to provide plenty of cooling air for the new LT1 V8. While the 2014 Corvette has a very low nose and front fascia, the front end slopes up quickly to the broad, flat hood that has vent for the air coming through the radiator on the leading edge of the flat portion. This allows the heated air that has passed through the C7’s radiator to exit the engine bay to help further keep temperatures down while also preventing that hot air from being sucked into the engine intake air outlet. Like other Corvettes, the front fenders have high peaks over the wheels that create the hulking, powerful look that we have come to expect from the modern Corvette and the C7 design achieves this look very well. The sharp angles of the carbon fiber hood flow from the front fascia up along either side of the bulging central section of the hood to create the prominent cowl that has been a recognizable trait of many Chevy performance models. It should also be pointed out that while the C7 looks nothing like the C1 – the 2014 Corvette offers covered headlights and a large central grille opening just like the original Corvette that debuted 60 years ago. Along the side, the profile of the 2014 Chevrolet Corvette is relatively similar to the past models with a longer front end, a short greenhouse area set towards the rear of the car with a ‘fastback’ rear glass design flowing down to a very short rear end area with a molded rear spoiler breaking up the sloping glass from the angular rear end. Like previous generations of the Corvette, the C7 wears high lines around the front and rear wheel openings that give the Corvette a super muscular look with the top of the rear quarter panels rising sharply from the rest of the car to meet the roofline as it slopes towards the back of the car. Overall, the changes made to the 2014 Chevrolet Corvette are extensive but they are presented in a gorgeous design that will surely guarantee another successful generation of the fabled Chevy Corvette. Some will question the departure from traditional design features – particularly across the back end – but as the sports car industry continues to demand new models that are more aggressive than both the past models and the current competition – this is a design change that should help the Corvette continue to compete on the global sports car market. More importantly, in addition to look great, the exterior design of the 2014 Corvette makes it one of the most aerodynamically perfect cars that General Motors has ever produced for road use. Under the hood, the 2014 Chevrolet Corvette is powered by the all-new LT1 V8 engine but as the case has been in the past, GM still isn’t releasing concrete power numbers although the figures of 450 horsepower and 450lb-ft of torque are the company’s projected goals. This lightweight mill should allow the C7 Corvette to very easily outrun the previous generation Corvette while also offering better fuel economy thanks to a combination of modern chassis and engine technology. This powerful LT1 engine comes with a standard 7-speed close ratio manual transmission with electronic rev matching although those who don’t want to deal with a clutch pedal can opt for a new 6-speed automatic transmission that features a sport mode and shift control via the steering wheel mounted paddle shifters. The power is put to the road via a set of high performance Goodyear F1 tires wrapped around 19 inch rims inch rims but for those who opt for the higher performance Z51 package, a set of slick 20” rollers painted gloss black look great and take some weight off of the corners. Helping to further improve the driving dynamics in every situation, GM has equipped with 2014 Corvette Stingray with 5 unique modes in the Driver Mode Selector with Weather, Eco, Tour, Sport and Track. Joining the unique wheels on the 2014 Chevrolet Corvette Stingray’s Z51 package is an electronic limited slip differential, a dry sump oiling system, an integrated cooling system for the brakes, the rear differential and the transmission and a unique aerodynamics package that GM intends will answer the prayers of those who intend to spend some serious time at the race track. Inside, the 2014 Chevrolet Corvette Stingray has been redesigned and refined to allow the C7 to properly fit into the high end sports car segment. This includes carbon fiber all over the place joined by tons of plush, soft leather and buyers have their choice of either a basic seat design or a lightweight, race purposed “competition” seat for those who want an even sportier look and feel. Of course, the C7 will also be packed with a state of the art infotainment system including a digital gauge cluster that will display the basics like RPM and speed – along with performance measures and driver settings in the center of the cluster. The 2014 Chevrolet Corvette Stingray coupe will go on sale during the third quarter of 2013 and like the rest of the recent Corvettes, the C7 will be produced at the company’s Bowling Green Kentucky plant. Pricing, actual power outputs, fuel economy figures and real world performance numbers will likely become available closer to the new Stingray’s launch later this year. Click any of the thumbnails on the right for a closer look at the 2014 Chevrolet Corvette Stingray (in Z51 form) and for more high resolution images from tonight’s debut, click here to visit the TorqueNews.com Facebook page! I haven't been a Corvette aesthetic fan since the 70s but this is very nice. Finally, a Corvette worthwhile looking. 604 HP, 0-60 in 4.5 seconds, with and ellcrtonicaley limited top speed of 171 mph Jesus Christ, I am truly impressed. For a car that big, those figures are absolutely insane. The estimated city mpg is 10 though XD? When you're that rich, gas money doesn't really matter though I suppose.